On April 25th, Kansas University held its annual Jayhawk alumni scrimmage game. In attendance this year was 89-year-old Bryan Sperry. Sperry has had one of the most incredible lives. He began his football career at the age of 17 when he started to play for Kansas University. However, this career was put on hold when World War II began. He served as an infantryman in one of the most notrious and bloodiest battles in World War II, Battle of the Bulge. He was able to return to the pigskin in 1946, where he found himself ultimately becoming a starting wide receiver. Sperry was even a player in the 1947 Orange Bowl. 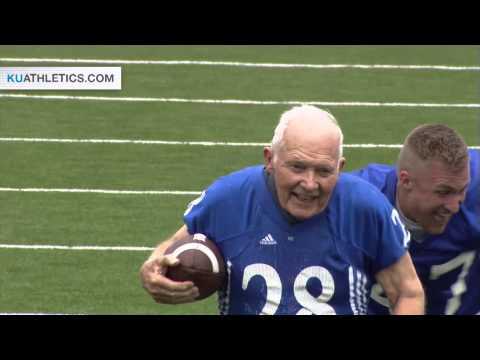 During the scrimmage, the elderly alumni was given a pass and made his way to the end zone. The other players on the field cheered him on and feigns tackles, giving him a celebratory hug once the run was complete. Sperry’s smile and his quote – “That was fun; I didn’t know if I could run” is enough to inspire anyone. If you need something uplifting in your life, this is it.